Marie C. (Colabelli) Ciampa – of Ogunquit, ME, died peacefully, February 5th. Beloved wife of Anthony M. Ciampa. Devoted mother of Anthony M. Ciampa III, his wife Charlene of Sterling, MA, Lynne Bailey of Cape Neddick, ME, Lisa Hurley, her fiancé Michael Reilly of Woburn and Kathrine Layman, her husband Andrew of Woburn. Dear sister of the late Mario “Chuck” Cole. Loving grandmother of Michael, his wife Irin, David, Matthew, Kelli, Christopher, Alex, Cole, James, Lucas and Davis. Cherished great-grandmother of Marcellus and Chloe. Her Funeral Mass will be held on her birthday, Saturday, February 9th at 10 a.m. in St. Charles Church, 280 Main St., Woburn. Relatives and friends are invited to pay their respects from 8:30-9:45 at the Lynch-Cantillon Funeral Home 263 Main St, Woburn, prior to the Mass. A Celebration of Life Service will take place in Ogunquit, ME at a later date and burial will be private. In lieu of flowers, remembrances may be made in Marie’s name to The Marginal Way Preservation Fund, P.O.Box 1455, Ogunquit, ME 03907. 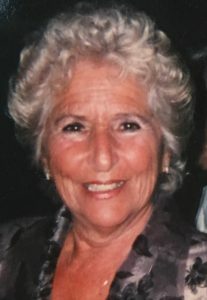 Marie C. (Colabelli) Ciampa – of Ogunquit, Maine, formally of Woburn, died peacefully, Tuesday, February 5th, surrounded by her family. She was the beloved wife of Anthony M. Ciampa. Born in Boston, Marie was a daughter of the late Mario and Marie (Pistone) Colabelli. Raised in Lewiston, ME, returning as a teen to Boston. She attended Mass College of Pharmacy where she received a certificate in Nursing. It was there that she met the love of her life. Marie and Anthony settled in Woburn and raised their family. As the children grew older, they traveled the world eventually summering in Ogunguit and wintering in Florida. When Anthony retired Marie became an entrepreneur opening her own Boutiques in Ogunquit. Marie was a woman of faith. She attended Mass regularly and was well known and loved in Ogunquit. From middle age on, Marie woke up with an ocean view. She walked around town daily with her beloved dog Luna and stopped to chat with the various “townies” and tourists. She was a conversationalist who made whoever she was addressing feel special. Marie had a thirst for learning, reading and solving puzzles. She taught the game of Mahjong and always was involved in a good book. Marie loved entertaining and did it well. She was a proper lovely lady. She cherished her time with her family and always had an encouraging word or a bit of advice for her children and grandchildren. Along with her husband Anthony, Marie is survived and will be deeply missed by her children Anthony M. Ciampa III, his wife Charlene of Sterling, MA, Lynne Bailey of Cape Neddick, ME, Lisa Hurley, her fiancé Michael Reilly of Woburn and Kathrine Layman, her husband Andrew of Woburn. Dear sister of the late Mario “Chuck” Cole. Loving grandmother of Michael, his wife Irin, David, Matthew, Kelli, Christopher, Alex, Cole, James, Lucas and Davis. Cherished great-grandmother of Marcellus and Chloe. Her Funeral Mass will be held on her birthday, Saturday, February 9th at 10 a.m. in St. Charles Church, 280 Main St., Woburn. Relatives and friends are invited to pay their respects from 8:30-9:45 at the Lynch-Cantillon Funeral Home 263 Main St, Woburn, prior to the Mass. A Celebration of Life Service will take place in Ogunquit, ME at a later date and burial will be private. In lieu of flowers, remembrances may be made in Marie’s name to The Marginal Way Preservation Fund, P.O.Box 1455, Ogunquit, ME 03907. Lisa and Mike, so sorry for your loss. I am so very sorry for the loss of your beautiful Mom. May you be comforted by the beautiful memories and the great love and care you shared. She is at peace now awaiting the reunion. We are so sorry to hear of your mom’s passing. Our thoughts and prayers are with your entire family at this difficult time. God bless! I am saddened to hear the passing of your mother; you are in my prayers during this difficult time.